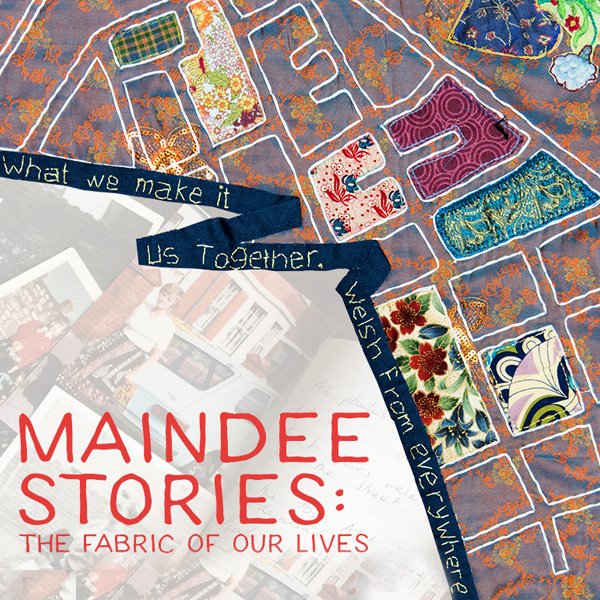 ‘Maindee Stories: The Fabric Of Our Lives’ was funded by Maindee Unlimited's New Paths grant and the Arts Council of Wales (IPP) 'Ideas, People, Places' strand. It was also awarded the Voluntary Arts Epic Award for Wales 2018. 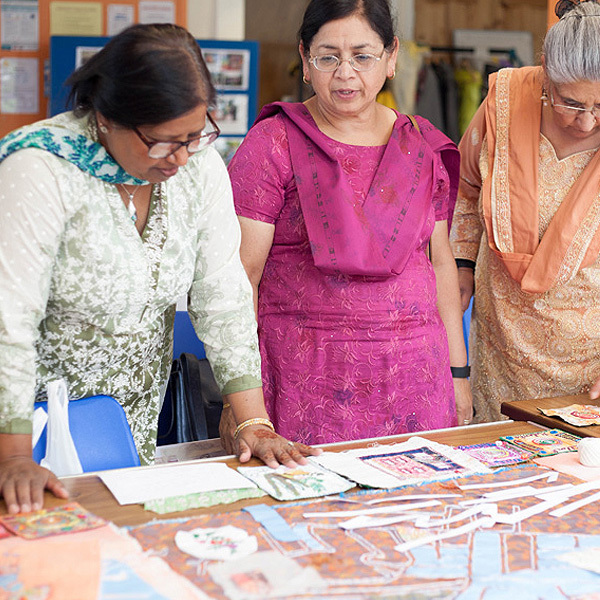 The textile artwork was created in between April and October 2016 with women from 'Coffee 'n' Laughs friendship group that meet weekly at Community House. 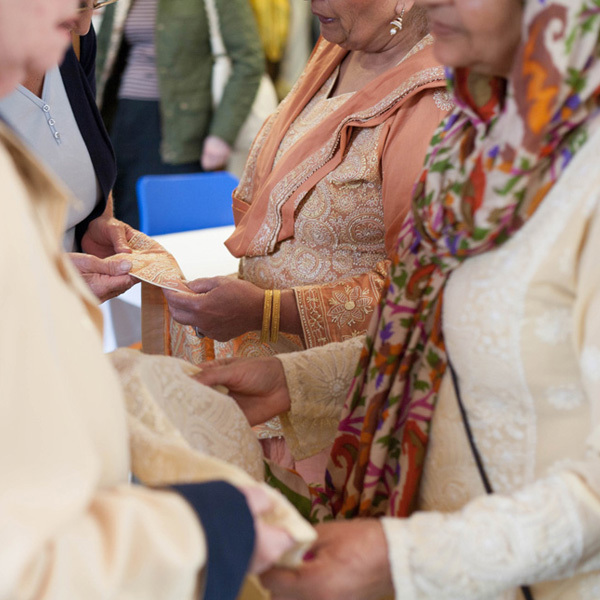 It's a wonderful group set up in 2008 to bring women of different cultures and faiths together who would otherwise be isolated. It gives us an opportunity to share, to slow down and to reconnect with a craft that not many had picked up since childhood. We discovered that there were many hidden talents and skills influenced by places as far a field as Bangladesh, Pakistan, Somalia and Iraq. 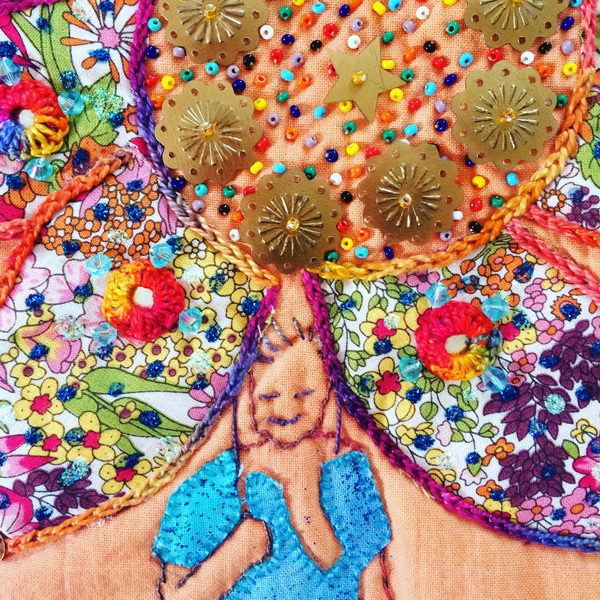 I love Grayson Perry’s work and created an opportunity for us to take a day trip to see ‘The Vanity of Small Differences’ at The Victoria Gallery. 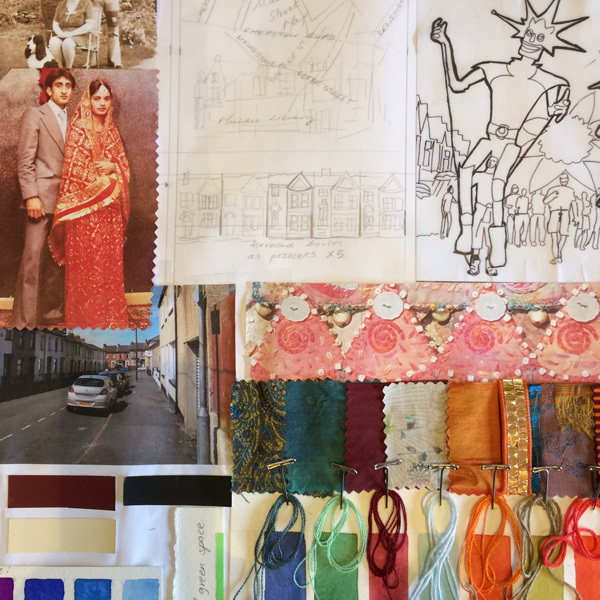 It was inspiring to see how Perry uses narrative within the medium of computer-generated textiles. 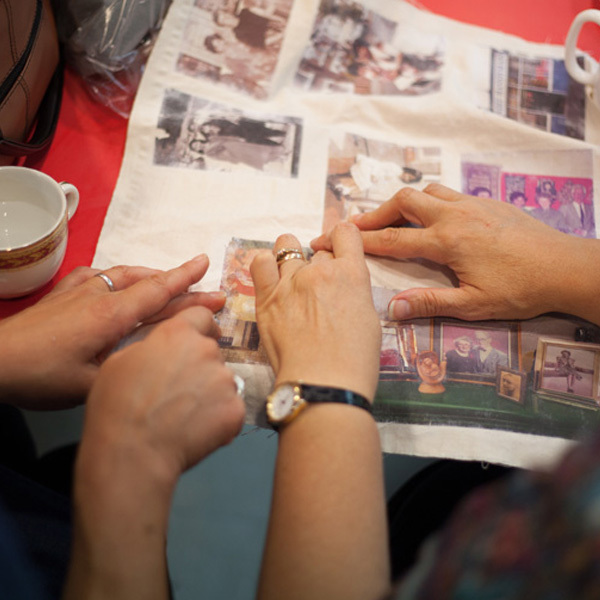 Twenty-five workshops took place which involved guest artists – Catherine Cains and embroidery designers Sandra Fowler and Linda McCarthy. 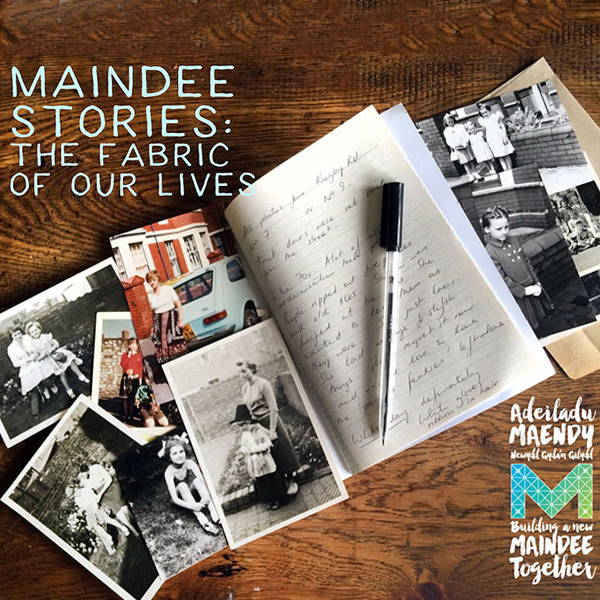 Maindee Stories embeds ideas about place, through story-telling and exploring historical aspects of the area. It has resulted in feelings of achievement and confidence. We have grown in numbers since the project started. 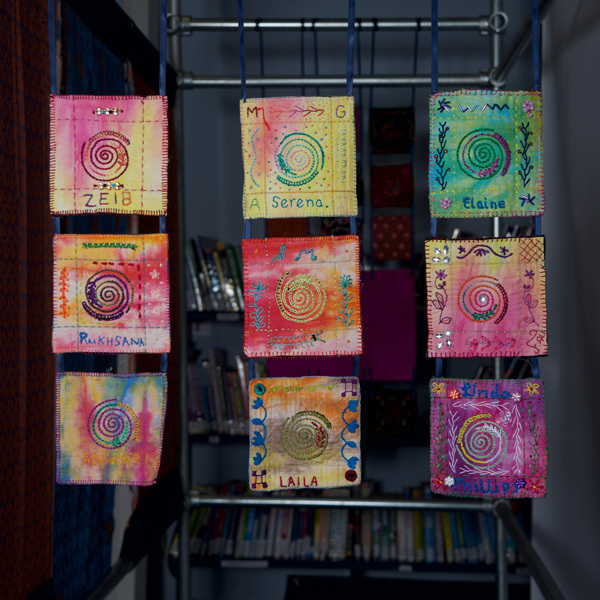 Guest artists have stayed and they create more projects as time goes by. 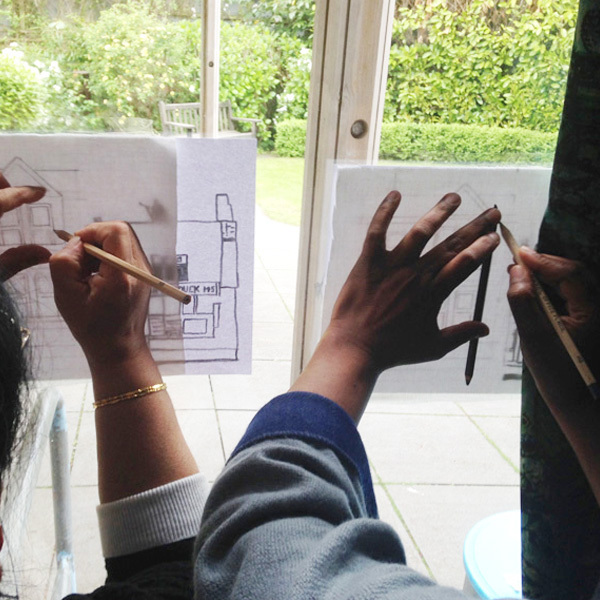 Everyone that takes part gives freely, putting their hearts and souls into the work. 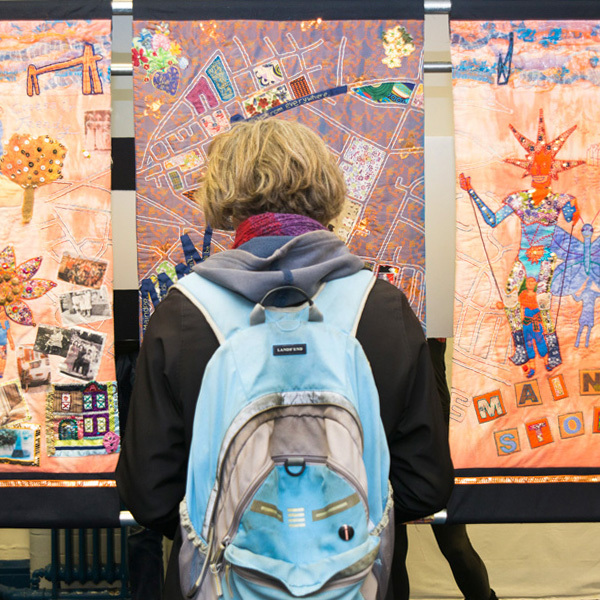 It is currently on display in the Chapel at Community House, Eton Road. Maindee Stories is a triptych made up of 3 panels. 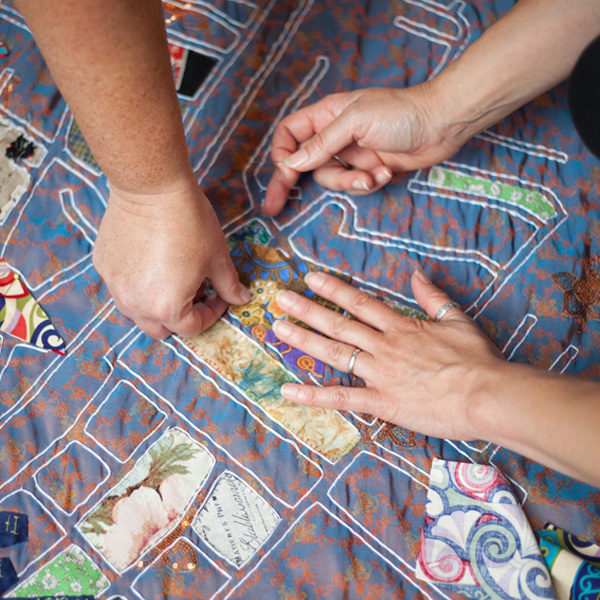 The central piece is a graphic street map hand stitched onto sari material. 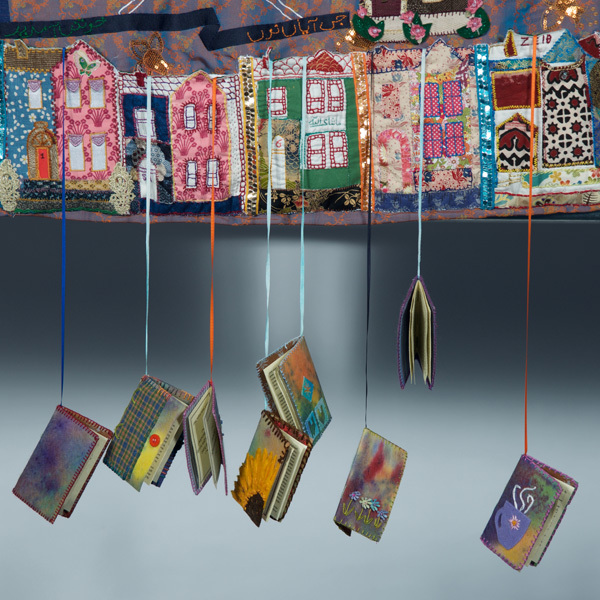 A row of typical Newport houses double up as pockets into which hand-crafted story books are inside. 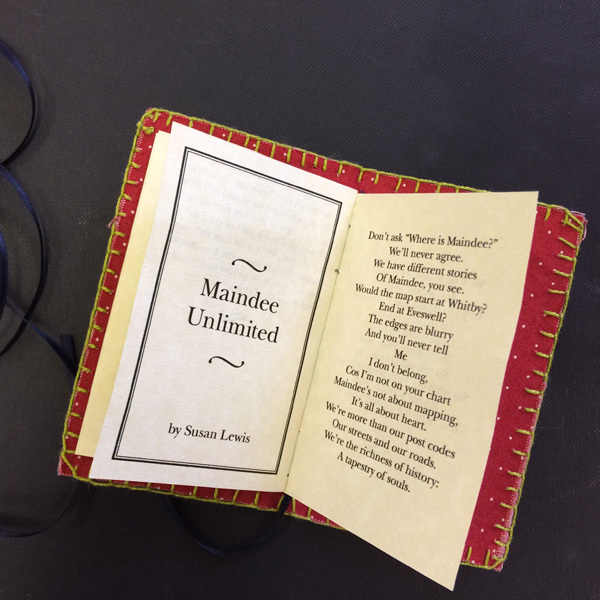 The hidden talents of group member Susan Lewis were discovered – she went on to perform her poetry at Maindee Festival's Garden stage in 2017. 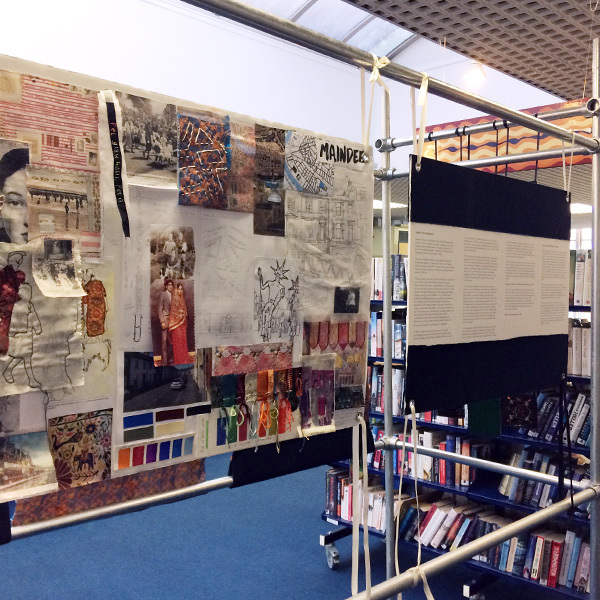 The 3 panels are threaded onto a scaffold structure, forming a rectangular box measuring 2.5m wide x 0.8m x 2.0m tall. In addition to the 3 panels, on each shortest side are a series of square embroideries that form a grid. 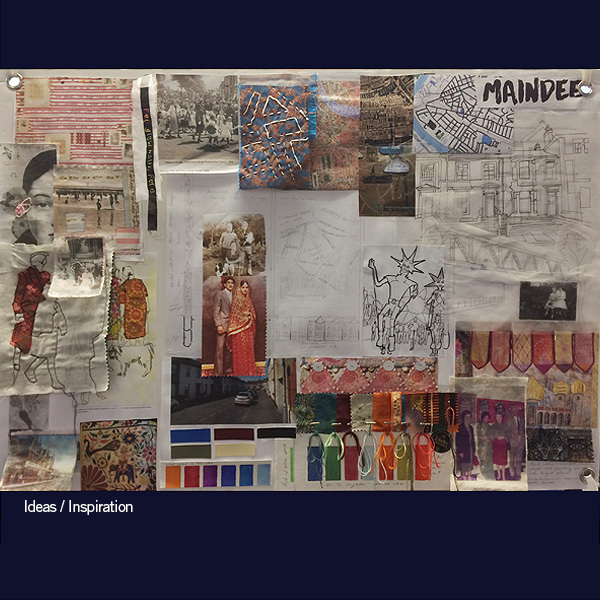 On the opposite side, a moodboard displays ideas and inspiration. 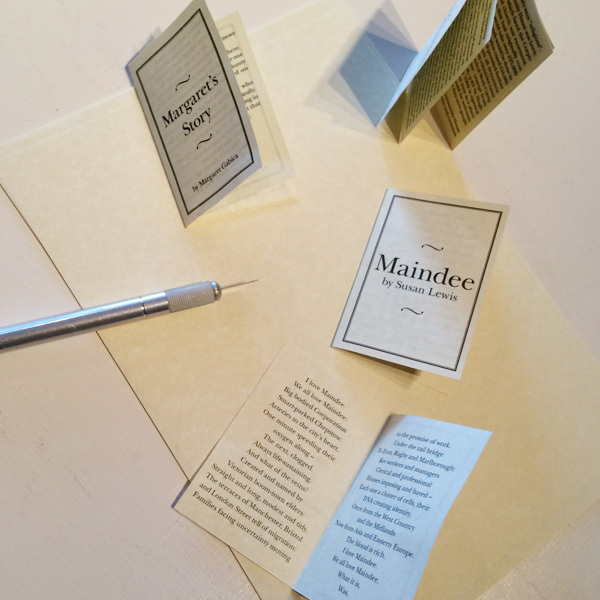 'Maindee Stories' is tactile, inviting the viewer to explore and discover its hidden stories and designs. 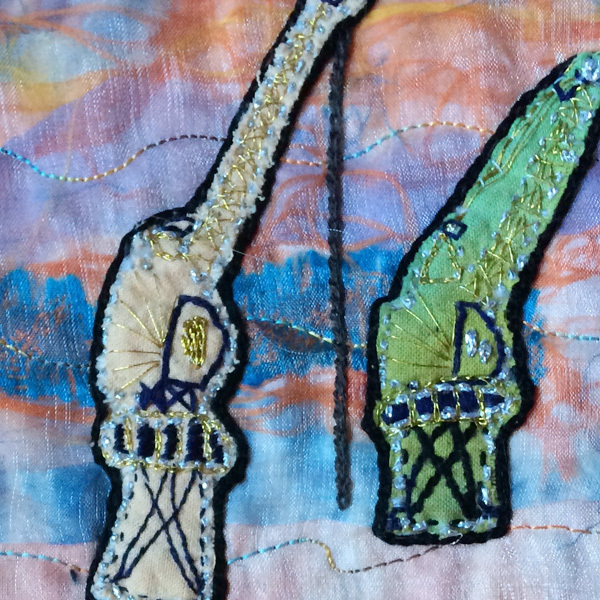 There are 2 outer panels, inspired by ‘Toran’ (from India) which when lifted reveal hidden embroideries and poems. 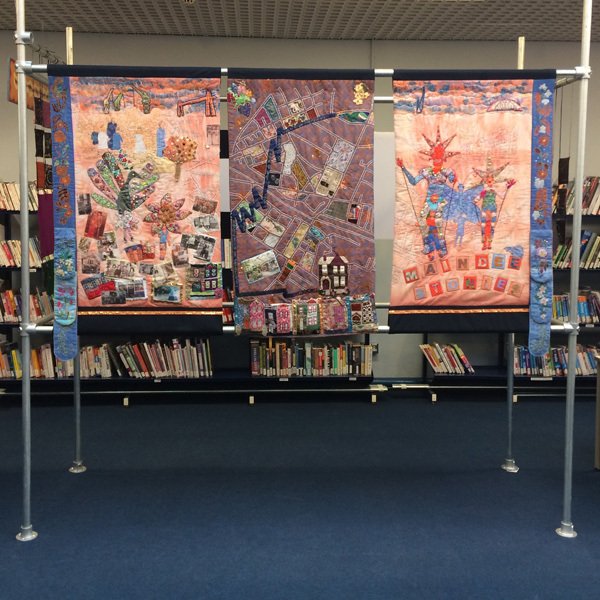 Maindee Stories is a celebration and was selected for Abergavenny Museum's Monmouthshire Women Making Change Exhibition which ran for a year. 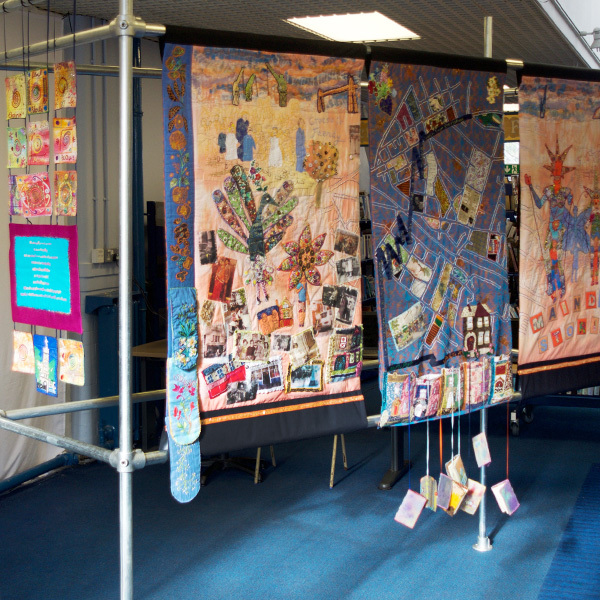 This exhibition won the Community History Network Award. 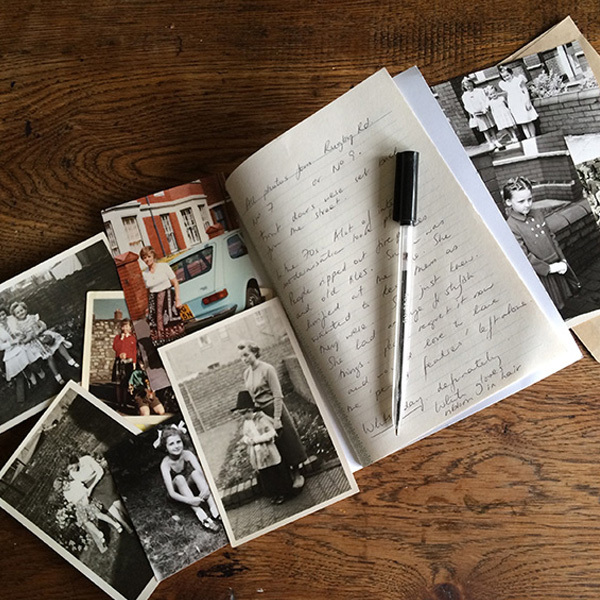 Links to blog posts about the project – there are many more!